*Secondary applications must be completed within two weeks (14 days) of receipt. After two weeks the link will no longer be available and the applicant will no longer be considered for admissions. The UNLV School of Medicine interview day provides applicants an opportunity to learn more about UNLV School of Medicine and for the faculty to learn more about you. Applicants who receive an email from the UNLV School of Medicine indicating they were selected for an interview must select and confirm an interview date, request a new date, or withdraw their application. Applications are now being accepted through the American Medical College Application Service. 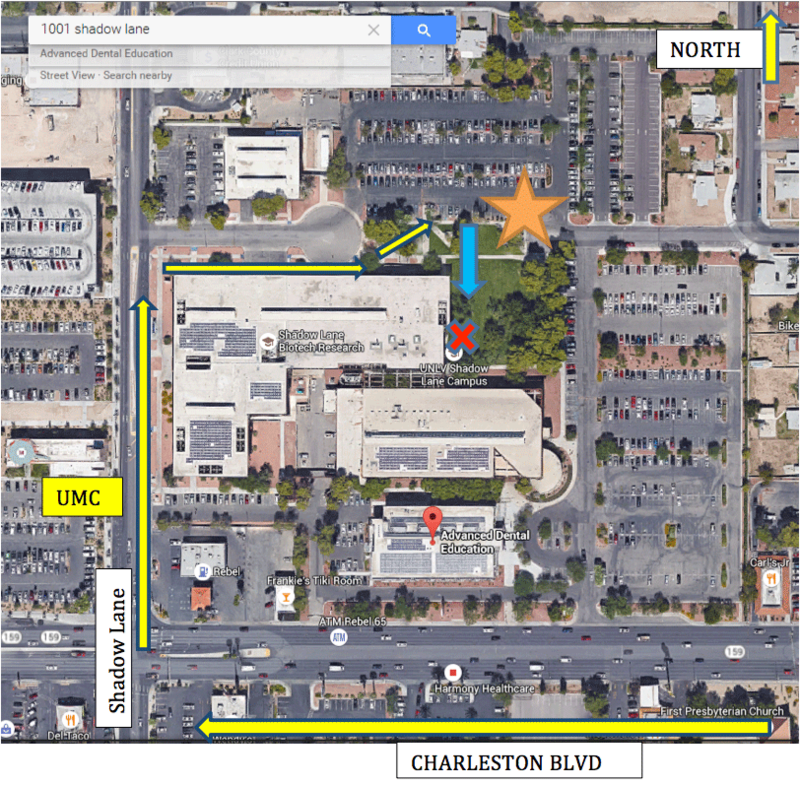 The UNLV School of Medicine is located at 1001 Shadow Lane, Las Vegas, NV 89106. We are located in Building B, Suite 260A. A map and parking instructions are included below. The main airport for Las Vegas is McCarran International Airport (LAS). Public ground transportation is available in the form of taxi, Uber, and Lyft. Rental cars can also be picked up at McCarran International Airport from vendors including: Advantage, Alamo, Avis, Budget, Dollar, E-Z, Enterprise, Hertz, National, Payless, Thrifty, and Zipcar. Las Vegas, NV 89109 1 S. Main St.
Las Vegas, NV 89101 2000 S. Las Vegas Blvd. Las Vegas, NV 89102 301 Fremont St.
Las Vegas, NV 89101 2650 S. Las Vegas Blvd. Take I-15 to Charleston Blvd. Pass the front of the UNLV Shadow Lane Campus (which is the Dental School side) and go to the traffic light for Shadow Lane (on the corner by UMC). Turn right onto Shadow Lane and then after the bus lane, turn right again on Hastings. Drive towards the cul-de-sac circle and head into the parking lot. Park in any spot around the orange star on the photo. Visitors without UNLV parking permits must use the Pay By Phone function listed on parking lot signage. Follow the blue arrow on the photo towards an exterior staircase. The doors will be locked. Please use the marked callbox to buzz the front desk for entry. Save time. Download the Pay By Phone App before arriving on campus for your interview.